Enhance the look of your '06-Current Dodge Charger SRT-8's hood with this awesome Hood Accent Graphic kit. Easy-to-install kit is packaged as one (1) PRECUT piece, ready to install, in a wide variety of colors - NO TRIMMING required (removal and reinstallation of windshield fluid nozzles necessary). Stripe package is not just a simple 20" (50.80cm) wide strip in a box. Kit consists of prefitted, tapered and contoured piece as shown. Overall graphic measurement is 40.091"x 20.254" (101.83cm x 51.45cm). 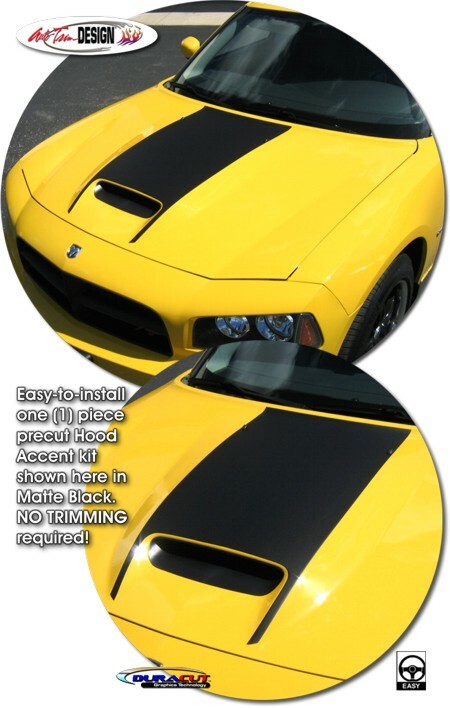 This kit is specifically made for the '06-Current Dodge Charger SRT-8 factory hood and will not fit any other vehicle.